Fire is a interesting element. Fire burns, melts, and destroys objects. Fire is fueled by oxygen. It always burns up and not down. The smoke that is a by-product of fire will smother someone that is caught in it. God is a consuming fire. When i read this, I think about what fire does to an object. A fire can melt away things, it will burn flesh, and it destroys pretty much anything in the way. So since fire is mainly used to destroy things, how does it fit in with God being a fire? God, when He saved me, melt my heart. The sin that was there, has been melted away, it has been destroyed. Now that I know God and walk with Him, when sin creeps in, God turns up the fire through His word. (Jer 23:29) It consumes my heart in a way that the sin that dwells cannot survive. We use the phrases, "I'm on fire for God" or "My fire has gone out." Well, what causes us to be "on fire" for God? 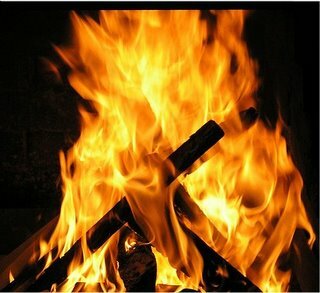 Just like fire needs oxygen to burn, so the word of God is needed to be "on fire" for God. Of course it all starts with God. He is the one that starts the fire in hearts in the first place. Another way we use the word fire is to describe passion. When God lights a consuming fire in our hearts, it is amazing how it transforms into a fire of passion for Him. I desire to live with the fire of correction that is followed by a fire of passion for Christ today. Well said! We should also fear the destruction fire can bring. God is also known to destroy things in His wrath! Very interesting.